We'd planned to have a day home today as the weather has been rubbish but it actually stopped raining after lunch so we decided to make the most of it and get outside! We've all been a bit germy recently so we were all definitely in need of some fresh air. And what better than some fresh sea air! We decided to visit one of our local beaches, Knoll Beach which is located in the Isle of Purbecks here in Dorset and looked after by the National Trust. We are NT members which meant free carparking for us! Resisting the urge to pop into the cafe for a hot chocolate, we headed straight for the beach where we faced with beautiful views in both directions. You can see all along the coastline towards Bournemouth and Hengisbury Head with the Isle of Wight in the distance. Then in the other direction are the white stacks of Old Harry Rocks - these mark the most easterly point of the Jurassic Coast. 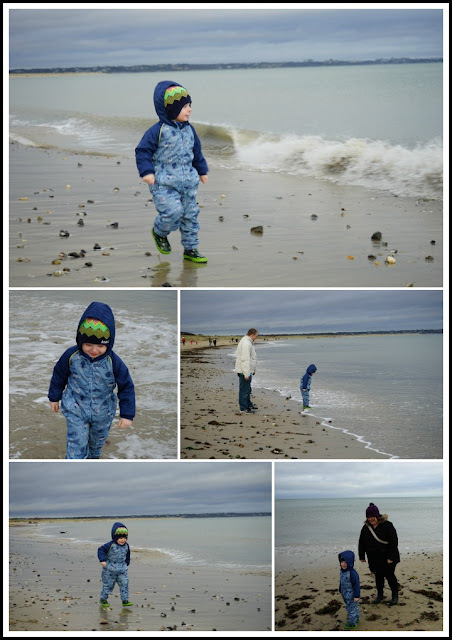 Elliot made a beeline for the water and was chasing the waves in and out. At one point the sea took him by surprise and he ended up knee deep in water!! Fortunately he had wellies and waterproofs on but I didn't....had visions of me having to run in to fish him out!! It's amazing how the simple things in life can entertain a 3 year old. 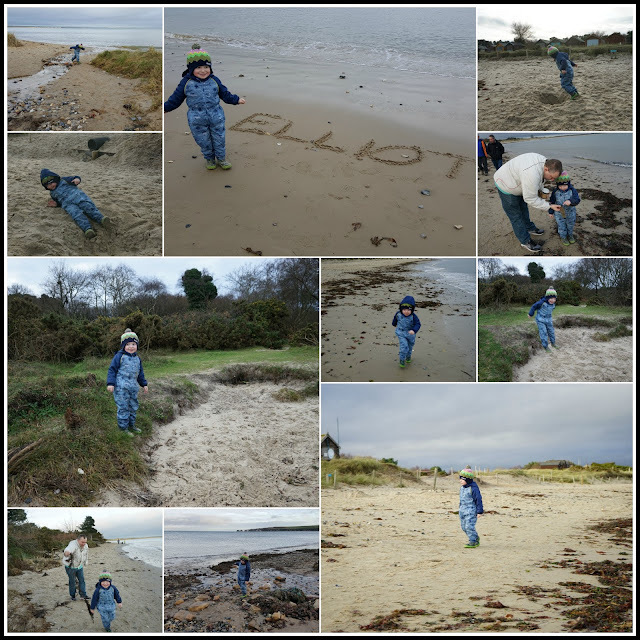 Elliot was kept busy with seashell spotting, stick finding, jumping off things, balancing on stepping stones, writing his name in the sand and watching it wash away, seagull chasing, wave jumping and running away from Daddy brandishing a bit of slimy seaweed! It was a gloomy day but the sun did try and come out on our walk back up the beach - the beaches in the distance were lit up in the late afternoon sunshine. I feel the same as you every time we go to the beach, I don't think I'll ever take it for granted, it is a real privilege to live close enough to pop down for an hour or two. It is such a natural playground for children and all the things Elliot enjoyed on your day here are things my children do and have done too. The beach is timeless and grows up with you. Thank you for sharing your winter day here with me on #CountryKids. We love popping to the beach too, it's such a lovely place. now noah is out of the 'putting EVERYTHING in his mouth' phase, it makes visits like this that bit easier and more tempting. As Fiona says - a natural playground. A brilliant day out, and thank goodness for waterproofs otherwise that splodge in the sea would've been the end of it! Thanks for linking to #daysoutwithatoddler. See you next month!